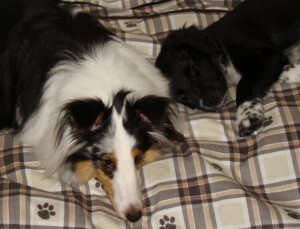 When we first brought Blizzard home we hoped that Smokey, our Sheltie would be okay with her. Well they get along GREAT! As you can see by the photo they sleep together. They do have their little skirmishes but its usually over the Frisbee(Smokey’s FAVORITE toy). Other than that they are becoming the best of friends. And Blizzard is also becoming my kids new best friend! Thank you for saving Blizzard and her siblings. She will have a long and happy life here with us! Just wanted to drop you a line and tell you that Blizzard is doing wonderfully! She was spayed May 6th. She graduated from Obedience school recently too. She has fit right into our family and stolen our hearts. Here is an updated photo for the Where are we now? page. 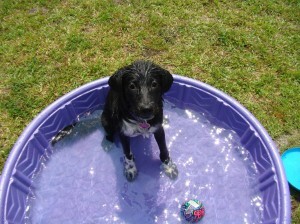 She is enjoying her pool on a hot GA day! Thanks again for such a wonderful little girl!